Form Factory is a machine shop located in Portland, Oregon focused primarily on prototype work, taking 3D CAD models and making them a physical reality through CNC precision machining. Over the past 14 years, Form Factory has grown from a one man operation with a single CNC mill into a highly respected shop in the Northwest US, making prototype models for clients all over the world. Harvey Tool customers may recognize the name Form Factory from their photo on the front cover of the Fall 2018 Catalog, as they were the first place winners of the #MachineTheImpossible Catalog Cover Contest! We talked with Brian Ross, Founder/Owner of Form Factory, to learn about how he suggests entrepreneurs and inventors think about prototyping their ideas, his unique experience working on many different models, his winning part in the #MachineTheImpossible contest, and more! Thanks for taking the time to talk with us for this Featured Customer post. To get started, tell us a little bit about Form Factory, how you got started, and what sort of products you manufacture. Prior to starting my own business, I had worked as a machinist at 4 different prototyping firms which is where I learned the trade and got the itch to run my own shop. I started Form Factory myself just over 14 years ago with a single Haas VF1. I had no client base and a bunch of loans. It was a scary time for me to jump in to entrepreneurship. Now, we have three CNC machines, various other components and machines, and four full-time employees. 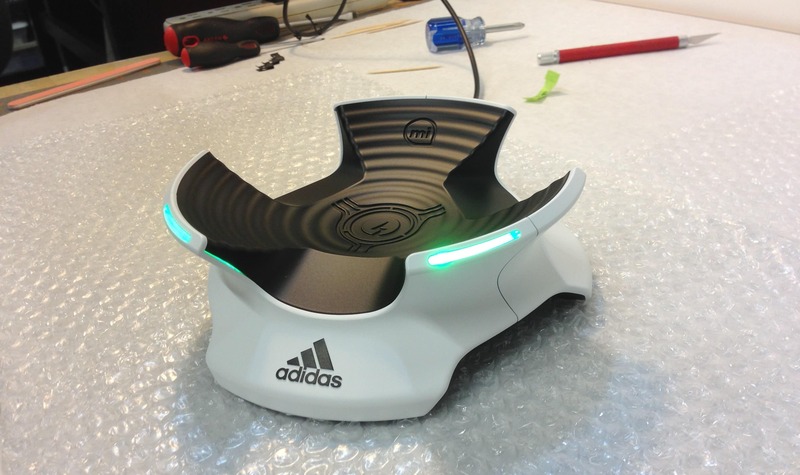 At Form Factory we focus primarily on industrial design models and prototypes. We do a lot of work in the electronics industry, making prototypes of cell phones, laptops, printers, and other consumer electronics. Many of our models are created for display at trade shows or in Kickstarter and other product announcement videos, but we also do a fair share of working prototypes as well. It all depends on what the client wants, and we pride ourselves on the ability to deliver exactly what they need. What sort of machines and software do you use in your shop? We currently have 3 CNC mills – a Haas VF1, Haas VF2, and Haas VF3. We like using machines made in the USA because we like making products in the USA. 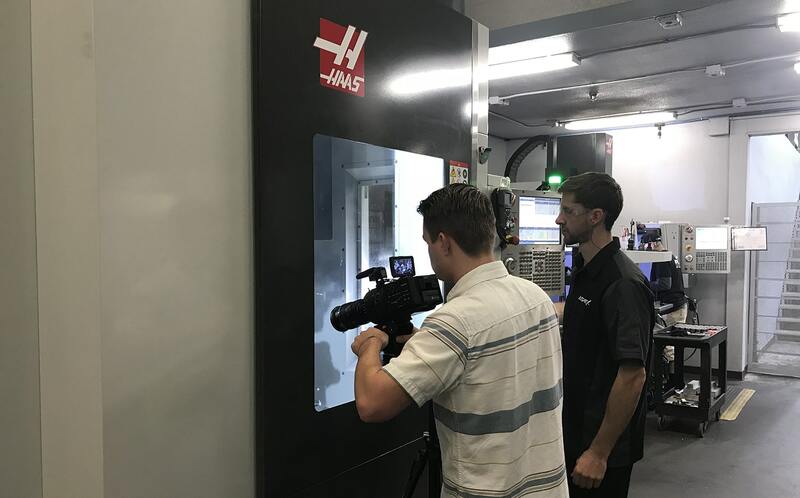 Haas is what I knew and had run predominantly, and Haas is fairly common in the Northwest so it was easier to find skilled employees in the area who knew these machines well. We use Mastercam for our CAM software, which is what I learned on. It also seems to be very common in this area which makes for an easy transition for new employees. What were some of the keys to success as you built Form Factory from the ground up? I based much of Form Factory’s business model on my past experiences in manufacturing. Many of the other small companies I had worked for ended up closing, even though the guys on the shop floor would be working lots of overtime and we had plenty of business. What I realized was that these other places often closed because of greed, over-expansion, and rapid growth which they could not sustain. They ended up overextending themselves and they could not keep the doors open as a result. I like the spot I am in now because while we can certainly expand, we have found a happy medium. 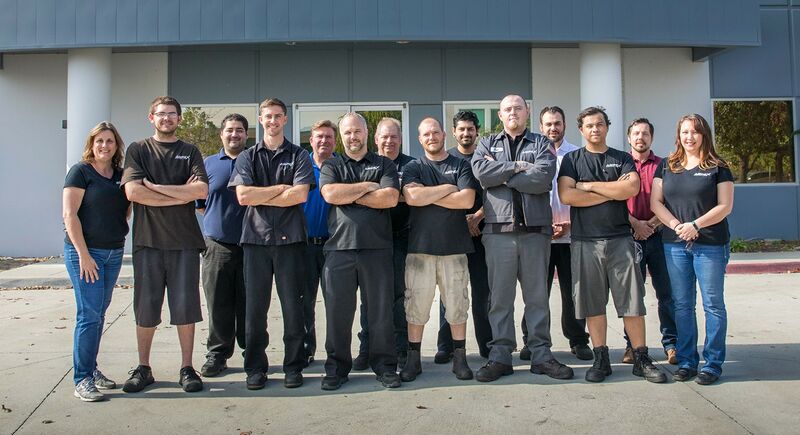 We have kept our customers happy and consistently deliver parts on time, so we get a lot of repeat business. Being a small company, word of mouth is one of our only forms of marketing. Word definitely gets around on how you treat people so we try to treat everyone with respect and honesty, which is key to running a good business. Prototype manufacturing is a very competitive segment of this industry. What sets Form Factory apart from the competition? Understanding how model making relates to industrial design separates us from a typical machine shop. We can take a prototype design or simple drawing and we are able to implement all of the functionality into a prototype model. 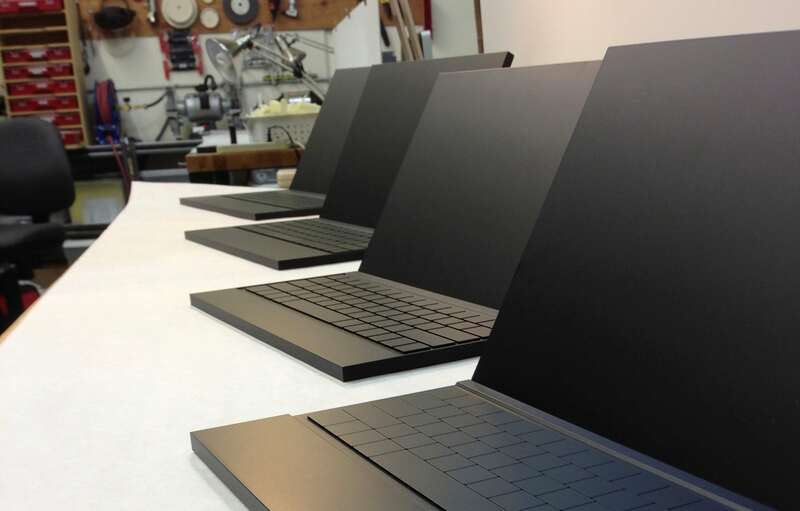 We do not deal much with the actual production run, which will come later, so we have the ability to focus more on the prototype and a customer’s exact needs to get a product off the ground. This level of expertise and focus sets us apart from your typical shop. For example, if the model is for photography purposes, a trade show display, or a promotional video, appearance will be key. We will spend more time working on building what we consider to be a true work of art; something that will immediately stand out to the consumer, but may lack in complete functionality. If the client requires a fully functioning prototype, we will spend more time making sure that all of the components work as intended over multiple stages of design. The final result may be a bit “uglier” than a prototype designed for appearance alone, but it will work as intended. Let’s say I have an idea for a new product. What should I know about getting my design manufactured? Right now, especially with 3D printing and cheap overseas manufacturing, it can seem very easy to prototype a new product. However, these options are not always the best route to take to get a quality prototype. With 3D printing, you get a huge step down in resolution and quality, although you can save in cost. You can also save on cost by having things made overseas, but the communication can easily breakdown and the quality is often lower. The other factor is that virtually anyone can end up copying your product overseas and you have very little protection against that. 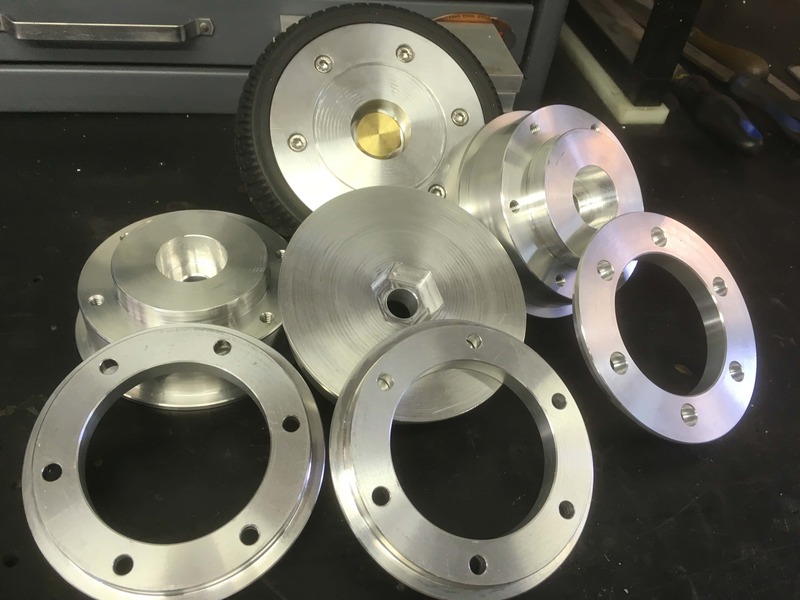 By going with a local machine shop and sticking with CNC-machined parts, you are guaranteed to get a higher quality finished product with better communication. We do a ton of back and forth communication with our clients to understand their exact design intent. With a prototype, there are often a lot of blanks that need to be filled in to completely understand the product, and we do our best to communicate with the client to deliver the perfect piece, and always on time. Sure, your cost may be higher, but the entire process will be smoother and the time saved on revisions or scrapping poor quality prototypes is invaluable. It sounds like you guys take a lot of pride in the work you do, which is great! Absolutely! Our models are all one of a kind works of art. We can take things from the early stages where a client might have an idea drawn on a napkin, all the way to a fully functional piece. Our goal is always to make parts look like they grew that way. In my opinion, taking a solid block of material and making it into a finished part is truly a work of art. We work hard to determine where the burrs are, what the radiuses are, and how the finish should look, amongst many other variables. We take a lot of pride in the finished appearance and want everyone in the shop to produce the same level of quality as their co-workers. We hold all ourselves and our work to very high standards. How has the online machinist community helped your business/changed your thinking/helped you grow as a machinist/business owner? I follow tons of great machinists and other companies on Instagram. It’s funny how quick you can get an idea from a simple picture or short video of another project somebody else is working on. I love machining because after 25 years, I am still learning so much every day. The machines, the software, and the tooling are changing so fast its hard to keep up. Every day I see something on Instagram that makes me say “Oh WOW!” or “Hey, I can do my part that way!” I was machining before there was an internet, so I really appreciate having an on-line community, and body of knowledge to draw from. You can find us on Instagram @FormFactory! We loved the ball in chain part you created for our #MachineTheImpossible Fall 2018 Catalog Cover contest, and so did our followers, as they voted you into first place. Tell us a little more about that part. So that piece was something I had been wanting to try for a while to challenge myself. It was not a part for a customer or part of a job, but simply a practice in more complex machining. The entire part was actually machined from one solid piece of aluminum on a 3 axis mill. With some clever fixturing and a few setups, I was able to make it work! Harvey Tool’s Tapered and Long Reach End Mills played a huge part in the creation. There would have been no way for me to get at those impossible angles or hard to reach areas without the multiple available dimensions and angles that you guys offer. In total, that piece took me about 20 hours, but it was a great piece to learn with and it definitely paid off in the end! As a small business, getting that exposure and marketing from being on your catalog cover was huge, and we appreciate the opportunity you gave us and the entire machinist community. To a small business like yours, what did it mean to you to be highlighted on the Fall 2018 catalog cover? I found out we had won when one of my customer’s emailed me congratulations! I was blown away! Even to be chosen as a finalist was exciting. The Harvey Tool Catalog is the ONE catalog we always have around the shop at the ready. I have been a Harvey fan for two decades, so making the cover of the catalog was pretty awesome! In your career, how has Harvey Tool helped you #MachineTheImpossible? Being able to overnight tools straight to the shop on a moment’s notice has saved us too many times to count. Harvey Tool makes some of the most impossible reach tooling; I still don’t know how they do it. ‘Back in the day” I would grind my own relief on an old Deckel. There’s nothing quite like looking for that extra 50 thou of reach and snapping off the tool! Now I let Harvey do ALL of that work for me, so I can focus on the machining. It takes nice tools to make nice parts. 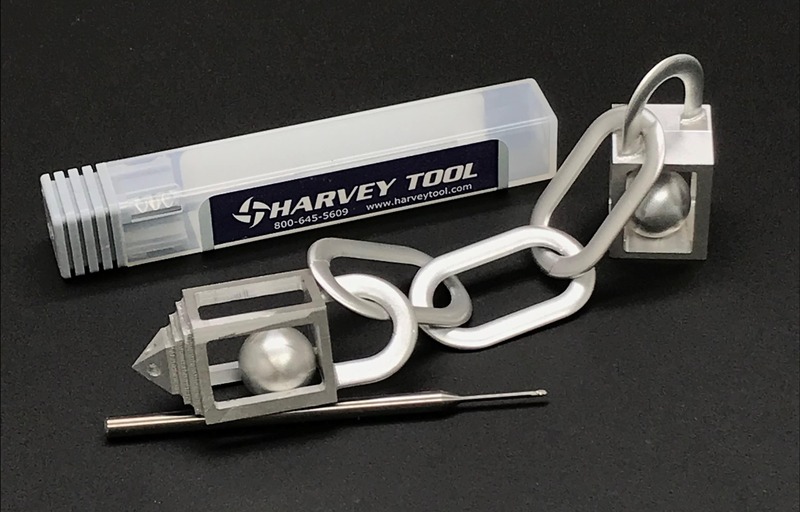 If you need tools that are always accurately relieved to just under the tool diameter, crazy sharp, and balanced, then look no further than Harvey Tool. If you could give one piece of advice to a new machinist ready to take the #PlungeIntoMachining, what would it be? Find the ‘Distance to Go’ setting or view on your machine’s control, and hit ‘feed hold’ with the first plunge of every new tool you set, and every new work offset, 100% of the time. It will save your mill and your parts from disaster. Machining is the art of doing thousands of simple things, exactly right and in the right order. The hard part is to keep your focus and pay keen attention through the entire process. Understand how easy it is to make a simple mistake, and how quickly you can be starting over. Allow yourself room for mistakes along the way by triple checking BEFORE your mill lets you know it’s too late. If you have other things on your mind, don’t machine parts. Would you like to be considered for a future “Featured Customer” blog? Click here to submit your information. Aspex CNC is a CNC machine shop based out of Poway, California. They offer prototype turning and milling, as well as production level machining. Their quick turnaround times and premium quality have garnered them some serious recognition in the manufacturing industry. Aspex CNC is just one of the four businesses that Gary Colle Jr. currently owns, but they are an essential part of his business ecosystem, creating parts for the other three product-based companies while also offering machining services to outside customers. We talked to Gary about his unique experiences in the industry, his thoughts on 5 axis machining, his advice for trying High Efficiency Milling, and more! Tell us a bit about how you got started in machining, your businesses, and how Aspex CNC was formed. It is a bit of an interesting story. I got started in manufacturing because my father designed, developed, and manufactured one of the first lines of Wheelchair Accessible Vehicle lifts, which allow people in wheelchairs to easily get in and out of their vehicles. 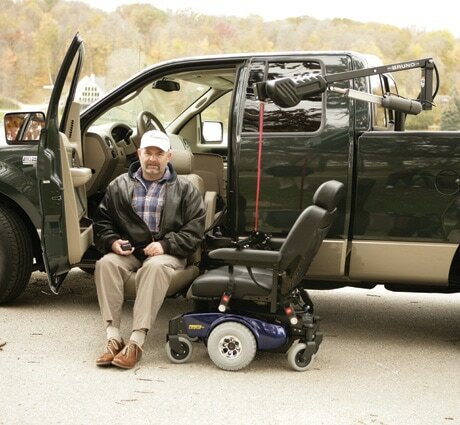 The company was called GoldenBoy Mobility and is still one of the four business I currently own and operate today. At a young age, I was working in my father’s shop, answering phones and doing odd jobs as young as the age of 10. When I got to high school, I worked after school and during the summers in a more hands-on position, welding parts, cutting up cars, and helping on the shop floor. This really inspired my love for metalworking at a young age. My dad used to let me mess around in the shop at night, so I started welding my own parts and trying to learn as much as I could. One day, someone came in and asked if I could create a “tuna tower” (an accessory for wakeboarding/water skiing) for their boat. I relented at first, but eventually gave in and welded all the parts together for him. After I made that one, word got around that I could create these at night. I started to advertise a little bit locally, and people started ordering more and more. That summer, I ended up making 50 of these towers and got noticed by a couple of big distributors. Scaling up like that made it necessary to outsource some of our parts to local machine shops, which is where I discovered machining. I had very little prior knowledge of machining, but once I stepped into my first machine shop, I was blown away. As that business grew even larger (now known as DBG Concepts), I needed more parts and needed them faster. We outgrew the local shops and purchased our first machine, a Fadal 4020 CNC Mill, from a local machine salesman, who also helped teach me the ropes. I learned a lot in those first 6 months about machining. Business kept ramping up, and my father eventually retired and I took over GoldenBoy Mobility. With all the extra parts we needed, we kept machining things in-house, and buying more mills. Eventually, machining became an even larger part of the business than either DBG Concepts or GoldenBoy Mobility, so we formed Aspex CNC to move our machining out of the product line and more into prototype work and production machining for other business. We still machine most of the parts for DBG and GoldenBoy in-house, but we are doing much more for outside sources than we used to. What sort of machines do you use in your shop? Right now, we are a Haas-only shop. We currently have eight Haas machines in our shop. Our lineup consists of a couple of lathes (ST10 and ST30), a Super Mini Mill, and five CNC Mills (VF2SS, VF2SSYT, VF4SS, VF5SS, and UMC750SS), with another UMC750 on the way! Which materials do you most often work with in your shop? We work with a lot of the common materials, 6061/7075 Aluminum, 1018/1045 Steel, 303/304/17-4ph Stainless, as well as plastics like Acetal, UHMW, HDPE, and PVC. 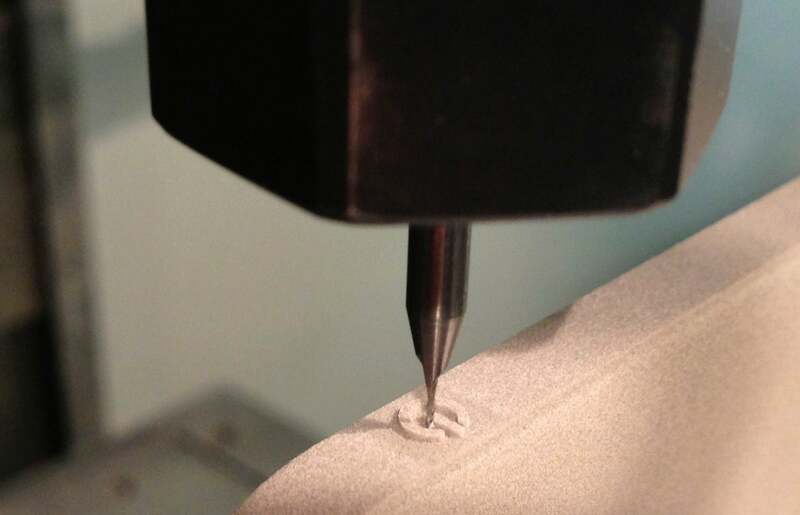 How has your experience been with 5 axis machining? If you don’t keep up with technology, you won’t be able to keep up with business, so learning multi-axis machining was a no-brainer for us. 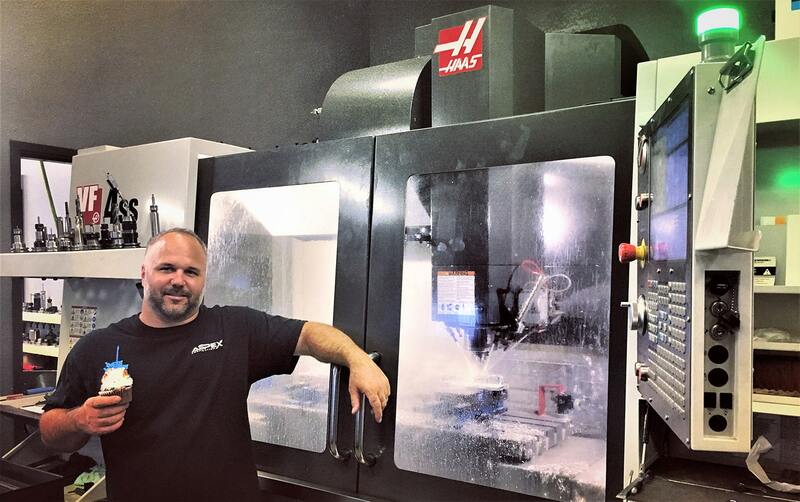 We first started with a Haas HRT210 4th axis rotary, and began to play with that. 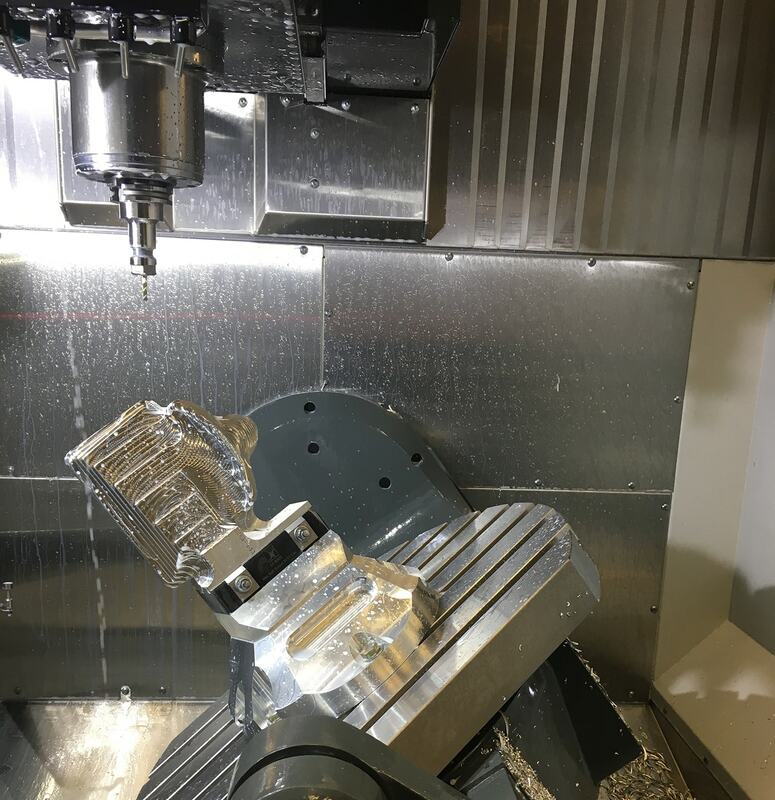 Over the next two years, we learned everything we could about multi-axis machining and made the decision to upgrade to a 5 axis machine. We actually went to IMTS that year to talk to manufacturers and find the perfect machine for us and ended up sticking with Haas because of their support platform and educational resources. 5 axis can be hard, but there are a lot of tools out there (HSM Works from Autodesk being one) that can help you learn. It does require a little more upfront work and discipline, but it eliminates a lot of setup time, creates new opportunities for our shop, and has been really good for us from a business standpoint. A big part of our business is machining one-off parts, so the 5 axis machine allows for a faster turnaround time for those odd shapes and sizes we come across. You are very active on social media promoting your business. How has the online machinist community helped your business? Honestly, even though it can become a bit of a distraction at times, using social media to share our work and partner up with companies like Harvey Tool and Helical has been a lot of fun. We are still young in the social media space, so we haven’t seen a massive impact yet, but the best is yet to come. We have received a few bites here and there which has led to work, but as with everything, it takes some time. We expect a lot of growth this year as we work on more really neat projects and continue to get our name out there. As we grow, the opportunities are going to come. What are some of the coolest projects you have ever worked on? Unfortunately, we can’t talk about most of the work we do, due to customer confidentiality, but we did just do a project for the State of California building a training vehicle for their driver’s education program. We designed and built a dual steering system that gave the driver’s trainer a second steering wheel on the passenger side of the car to be used during training. Another job we just finished up was some parts for the new Raiders football stadium in Las Vegas. They contacted us in a pinch and needed them in two days, and we made it happen. It is pretty cool to know you played a part in a huge project like that. Aspex CNC also does a lot of work with racing/off-road vehicle companies, often machining parts for the chassis and suspension components. We have worked on projects for companies like Scarbo Performance, ID Designs, TSCO Racing and a whole list of others. You can only use one machine for the rest of your life. Do you go with a CNC Milling machine or the Lathe? I would hate to have to choose between them, but it is 100% the CNC Mill. 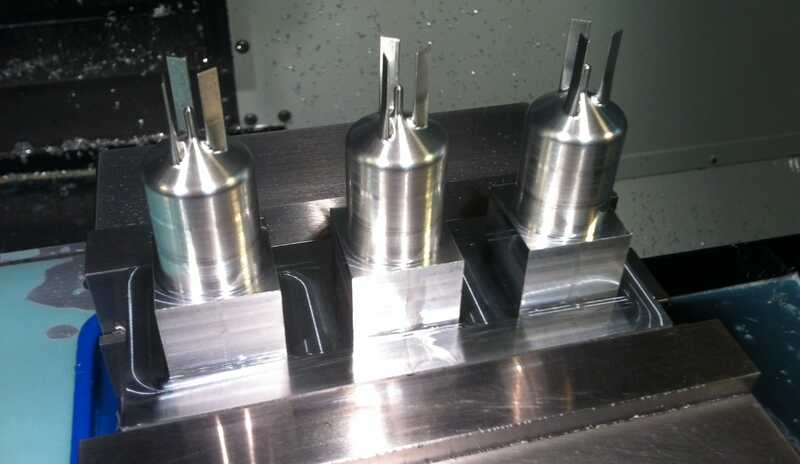 I love ripping around with end mills and working with the 5 axis machines. It is mind blowing what these things are capable of. Why is manufacturing products in America important to you? Growing up in the industry which I did while working under my father (building wheelchair accessible vehicles), we had a lot of customers who were veterans coming back from Vietnam or Desert Storm who had been injured overseas and needed extra accommodations, which we could provide for them. The veterans I have worked with made me so patriotic with their stories and courage. We also get to work on a lot of projects with the US Department of Veteran’s Affairs, which is putting money back into the American economy by supporting companies like ours and contracting us to make these vehicles. It only makes sense that we employ more people here and avoid sending things overseas to support those who have supported us. 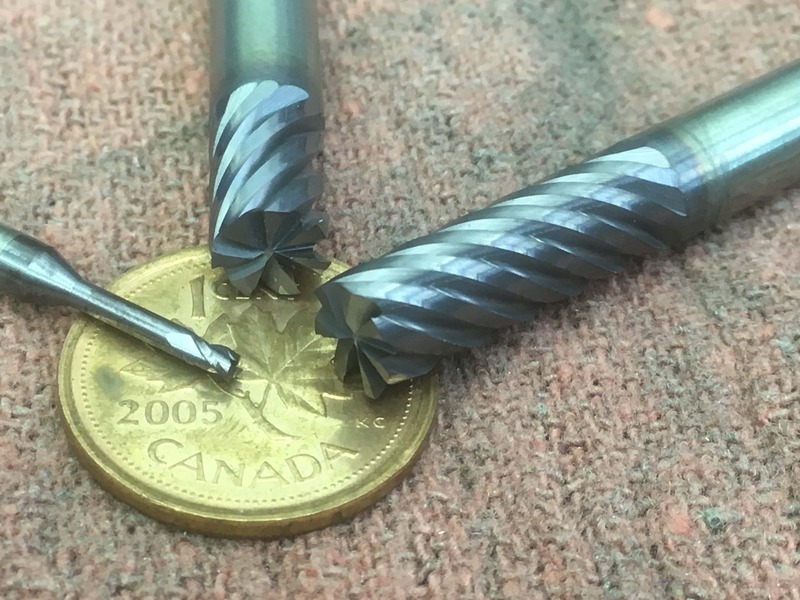 Do you utilize High Efficiency Milling (HEM) techniques in your shop? What advice do you have for those who are getting started with HEM? The biggest thing is listening to your tool manufacturer for recommendations and then cut those in half to start. From there, work your way up until you are comfortable. Just because the tool can handle it doesn’t necessarily mean your machine, work holding and or set up can, so I would advise people to walk before you run when it comes to HEM. Be conservative and establish good habits from the start. You can get more aggressive as your career starts to take off, but don’t run out and try to run the biggest and baddest machines on day one and try to cut corners. 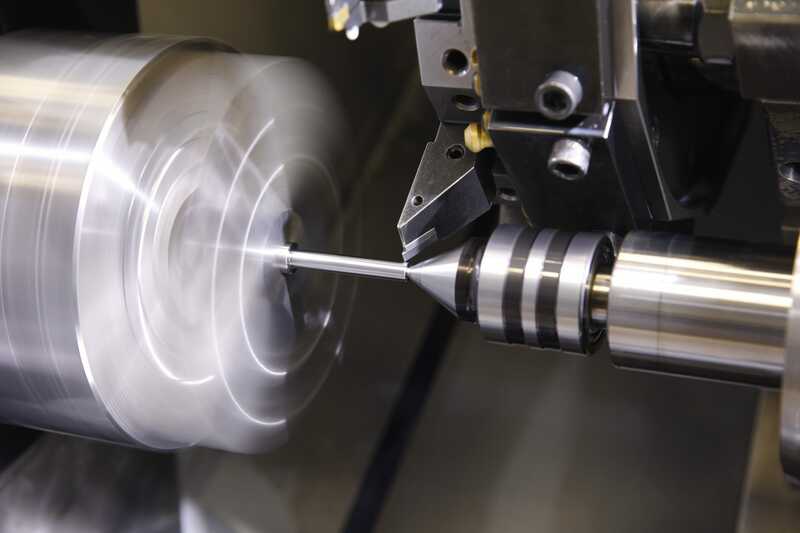 You need to learn what is behind machining; you can get easily lost in all the technology that is available, but you need to understand the core science behind it first. Take it slow, because if you go too fast, you might miss something important along the way. Is there anything else you would like to share with the In The Loupe community? The best thing is building relationships with companies like Haas, Harvey Tool, and Helical. Not only do they provide great service and support for you, but it quickly becomes a mutually beneficial relationship. As we give feedback to the tool and machine manufacturers, and even our metal supplier, it helps them improve their products, which in turn allows our shop to increase our production and efficiency. Also, having a good team with good people makes all the difference. No matter how many machines you have and how automated you get, you still need good people on your side. I would put my guys up against any other machine shop out there in terms of skill, and it is a big part of what has made our business so successful. 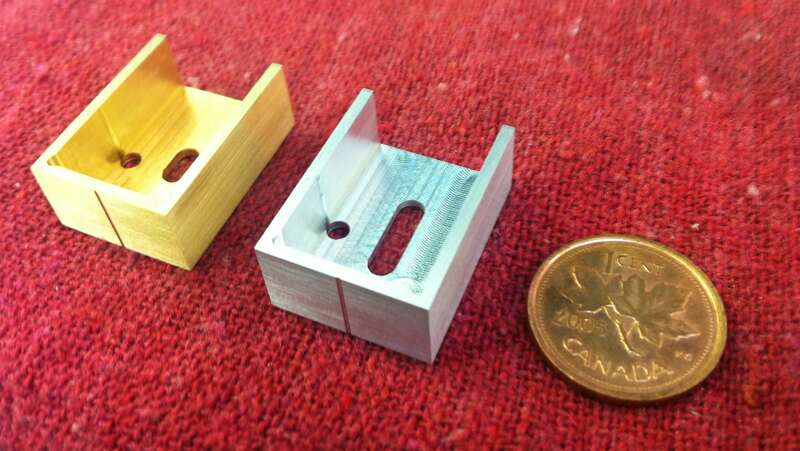 Anderson Prototypes is a custom machine shop in Port Moody, British Columbia. Working with everything from Titanium to Bamboo, they create mechanical mechanisms and working prototypes of new technology. By applying 25 years of experience with manual and CNC machinery, they craft amazing parts, some even bordering on impossible. The team at Anderson Prototypes works in a variety of industries, ranging from large-scale prototype work to small batch production, machine repair, and even movie and TV props. 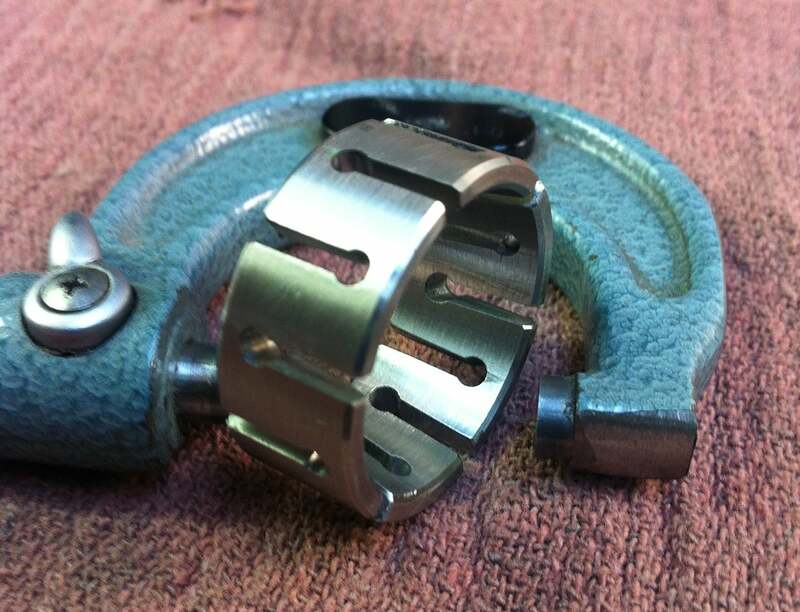 Jim Anderson, a 30 year veteran of the manufacturing industry, is the Founder and Owner of Anderson Prototypes. We caught up with Jim and talked to him about some of the “impossible” projects his team likes to take, his experiences in the film industry, and his advice for the aspiring machinist. Tell us a bit about your shop, how you got started, and what sort of products you manufacture. I started in machining in 1985, as a full-time student in a machining class at a local community college. I spent years working in jobbing shops, plastic mold injection shops, and specialized start-up companies, scratch building a range of things from high-speed water “pouch” filling machines to hydrogen fuel-cells. Today I work with a wide range of clients including 3 submarine companies, a military contractor, companies that use custom built or modified ROVs and drones, food packaging companies, production companies needing film and TV props, and more. What made you get into machining? I have always been an actively creative person, and I enjoyed wood and machine shop in high school. I found a creative outlet for my talents to build and fix things inside the machine shop environment. I continue to study machines and items, to understand how they were made, and how it could be made better or simplified. What is your favorite part of this profession? I always enjoy creating something for a client that they have been dreaming of, sometimes for years. They come to me with a sketch on a napkin or a verbal idea, and I turn that dream into reality. When they come to pick it up and see it for the first time, the emotions are tremendous! I have 2 Tormach 1100 CNC mills, one 4 axis and the other 3 axis, a Sherline 2000, 4 axis CNC mill, a Frankenstein CNC lathe with a 8 station tool changer for small work, a Milltronics ML-17 CNC lathe, a Colchester Student Engine Lathe, and a smaller manual milling machine. I also have drill presses, tapping heads and tons of specialized fixturing and work holding devices, as well as a 60 ton hydraulic press and the specialized equipment that comes with it. Which materials do you work with in your shop? Just about everything. Lots of plastics, PEEK, Delrin and Acrylic, aluminum, steels, stainless steels, carbon fiber, different woods, laminates, and more. What sets Anderson Prototypes apart from the competition? We often take on jobs that other shops won’t, due to our team’s large vision. We stand behind every piece we make and have zero returned items to date. Embodying both old-school traditions and cutting-edge technology, Anderson Prototypes believes that “Impossible is just an Opinion”. We work with a project from the very beginning to the time it is up and running at the client’s facility. 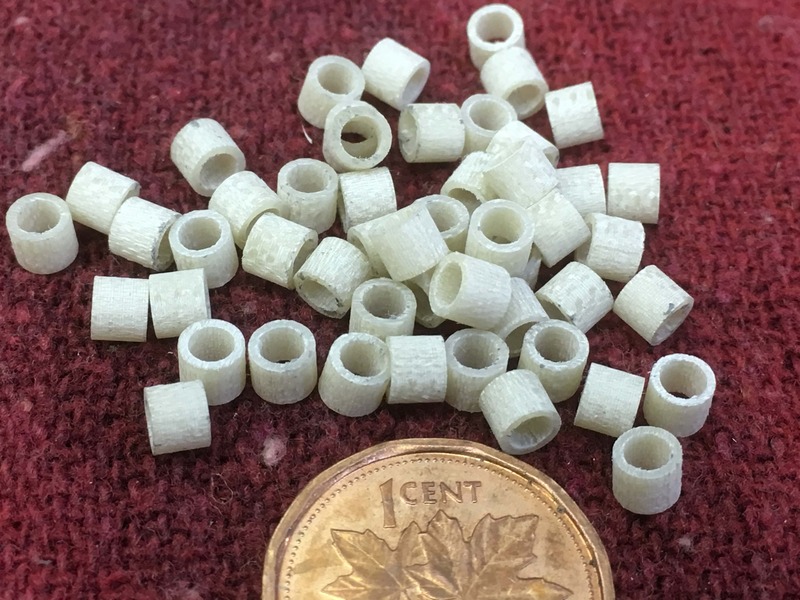 We work with building very small detailed machines to unique and weird items that someone dreamed up and could not find anyone able to make. We also love to give back to the community. We have sponsored local high school and university students in competitions, and we have played a part in the Maker Community since Day One. We also made and donated a doggy wheelchair to a dog in need (YouTube), and we sponsor a local softball league. How did you get into the entertainment/prop business? Vancouver has a huge movie industry, and there are many people in my network that work in the industry. The need for various props, new equipment, and repairs can go up and down as movies are being filmed. The first job I did (I think), was for a movie called Space Buddies, the 4th or 5th entry in the Air Bud movie series. I made the Doggles (dog goggles), that the dog is wearing on the DVD cover. Most movies require a Non-Disclosure Agreements before any work is done, so I can’t talk about much, but I have made my impact on the screen, behind the scenes, and even live on stage. I also did a major prop for an Australian TV show that was apparently popular down under, so you never know where this work will take you! Who is the most famous contact that you have worked on a project with? I have met many directors and producers of large budget films and TV shows. Unfortunately, because of the Non-Disclosure Agreements, I cannot mention any names. 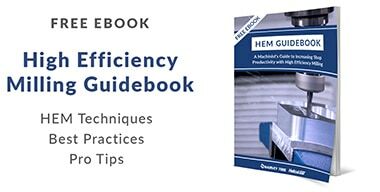 Why is high-quality tool performance important to you? I buy all my tooling from North America. I am lucky enough to have a solid carbide tooling manufacturer 5 miles from my shop, so I get quality endmills, made to order. When I need something specialized, Harvey is the only company I go to. When a tool does more than I expect, I make more money and have less stress. I count on that and become a return customer. For example, I used a .018″ Miniature End Mill (#73018-C3) on some acrylic parts I was making. There were 40 parts in total, all around the size of a stamp, with lots of tiny details, high tolerances, and very small features. I had the machine running at 15,500 RPM for 3 weeks, and I only broke one tool in that entire run. What a great tool! What is your favorite process to work on as a machinist? I really enjoy making something I have never worked on before, that new challenge. Often it seems that I am designing new items now more than ever. I have to do things that are not being done commercially and I stand behind it. So I might run the manual lathe, the CNC mill and then the CNC lathe on one part. I enjoy the variety. Why is manufacturing your products in North America important to you? American and Canadian-made products are very important to me. I purchase North American-made products like steel and aluminum, and bearings and fasteners all of kinds. I also access services locally, such as laser cutting, anodizing and powder coating, to support these local businesses. I feel its very important to the customer making the purchase that these are products my neighbors are helping to build. Take the time to take an accredited machine shop training course, like I did. It will give you all the groundwork to understand the real world of machining. I know a few fellas with small CNCs that can’t make a living because they don’t understand the depth of set-ups or work holding, for example, because they never learned from an expert. They can’t make parts fast enough, they charge 1/2 of what I do, and it takes then 3 times as long, so they simply can’t compete with me. Just be aware that it doesn’t happen overnight; I was a Journeyman Machinist for over 30 years, and still ask for help from my mentors occasionally. Oh, and find yourself a quality machine. Find a good used HAAS, or OKK, or something made in the US, UK or Europe. Your clients will respect you more and it will work longer and more accurately. I am grateful for the education I have received from the many journeyman machinists, engineers, mechanics, electricians, pilots, sea captains and more who I have worked beside in my years. I am happy to share and offer problem-solving, sometimes for free, other times at consultation rates. When a young eager person asks me a question, I do the best I can to answer it in a way that benefits them long term. Sometimes they don’t like the answer, but I tell them to come back in 6 months and tell me how it went. That’s when the rubber hits the road. Photos courtesy of Anderson Prototypes.